You might have thought that when Asus debuted its water-cooled GX700 laptop last year that it would be a one-and-done design, but you'd be wrong. 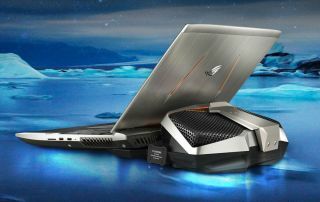 Asus is at it again, this time with the ROG GX800, a similar looking system that's even bigger and more powerful. Instead of a 17-inch panel, Asus supersized the ROG GX800 with an 18.4-inch display. It still boasts a 4K (3840x2160) resolution, as anything less could be deemed silly on such a sensible system (just a bit of slight sarcasm there), along with 100 percent coverage of the RGB color space. Oh, and it supports G-Sync, too. Underneath the massive hood is an Intel Core i7-6820HK processor that's begging to be overclocked and not one, but two GeForce GTX 1080 GPUs in SLI. Yeah, it's like that. This is a no-compromise laptop. Well, except for the obvious—portability. It's big (458x338x454mm) and heavy (5.7kg) all on its own, but add the Hydro Overclocking System, which tacks on another 4.7kg, and you're looking at staying stationary for a spell. The cooling system is the most unique thing about the GX800. It's essentially a liquid cooling dock that allows you to overclock the CPU, GPU, and RAM without fear of the thing cooking itself. "With the Hydro Overclocking System, ROG GX800’s Intel K-SKU CPU can be overclocked to 4.2GHz so you get mind-blowing levels of performance. The graphics cards can be overclocked to 1961MHz, while VRAM and DRAM can be pushed up to 5,200MHz and 2,800MHz respectively," Asus claims. Configurations will come with up to 64GB of DDR4-2800 RAM. It also supports up to three M.2 PCIe-based SSDs in RAID 0 and has built in 802.11ac Wi-Fi, Bluetooth 4.1, two USB 3.1 Type C ports, three USB 3.0 ports, separate microphone and headphone jacks, a GbE LAN port, HDMI and mini DisplayPort output, and a memory card reader. Asus didn't say when the GX800 will be available or for how much, though with the GX700 selling for around $4,700, we suspect this one will top the $5,000 mark.